Blooming is the optical effect where light from a bright source (such as a glint) appears to leak into surrounding objects. The Bloom image effect adds bloom and also automatically generates lens flares in a highly efficient way. Bloom is a very distinctive effect that can make a big difference to a scene and may suggest a magical or dreamlike environment especially when used in conjunction with HDR rendering. On the other hand, given proper settings it’s also possible to enhance photorealism using this effect. Glow around very bright objects is a common phenomena observed in film and photography, where luminance values differ vastly. Bloom is an enhanced version of the simpler but optimized Bloom (Optimized) and older Bloom And Flares image effects. This example shows a proper HDR glow as created by the Bloom effect. 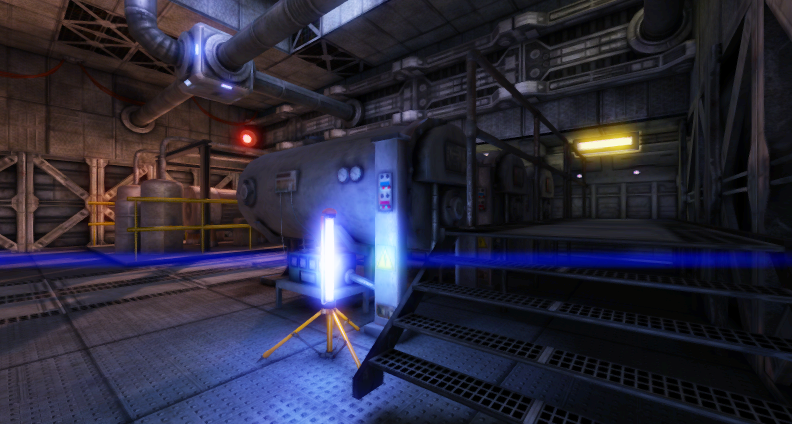 In this scene, bloom uses a threshold of 1.0 indicating that only HDR reflections, highlights or emissive surfaces glow, but common lighting is generally unaffected. In this particular example, only the car window (sporting the reflection of HDR sun values) glows. Here is the same scene shown without the Bloom effect. Using Bloom can add realism to your scenes. As with the other image effects, you must have the Standard Assets Effects package installed before it becomes available. Quality High quality preserves high frequencies and reduces aliasing. Mode Choose complex mode to show advanced options. Blend The method used to add bloom to the color buffer. The softer Screen mode is better for preserving bright image details but doesn’t work with HDR. HDR Whether bloom is using HDR buffers. This will result in a different look as pixel intensities may leave the [0,1] range, see details in tonemapping and HDR. Intensity The global light intensity of the added light (affects bloom and lens flares). Threshold Regions of the image brighter than this threshold receive blooming (and potentially lens flares). RGB Threshold Chose different thresholds for R, G and B. Blur iterations The number of times gaussian blur is applied. More iterations improve smoothness but take extra time to process and hide small frequencies. Sample distance The max radius of the blur. Does not affect performance. Lens Flares The type of lens flare. The options are Ghosting, Anamorphic or a mix of the two. Local intensity Local intensity used only for lens flares. 0 disables lens flares entirely. Threshold The accumulative light intensity threshold that defines which image parts are candidates for lens flares. Blend modes determine the way that two images will be combined when overlaid. Each pixel from the base image is combined mathematically with the pixel in the corresponding position in the overlay image. Two blend modes are available for this image effect, Add and Screen. When the images are blended in Add mode, the values of the color channels (red, green and blue) are simply added together and clamped to the maximum value of 1. The overall effect is that areas of each image that aren’t especially bright can easily blend to maximum brightness in the result. The final image tends to lose color and detail and so Add mode is useful when a dazzling “white out” effect is required. Screen mode is so named because it simulates the effect of projecting the two source images onto a white screen simultaneously. Each color channel is combined separately but identically to the others. Firstly, the channel values of the two source pixels are inverted (ie, subtracted from 1). Then, the two inverted values are multiplied together and the result is inverted. The result is brighter than either of the two source pixels but it will be at maximum brightness only if one of the source colors was also. The overall effect is that more color variation and detail from the source images is preserved, leading to a gentler effect than Add mode.